We’d love your help. 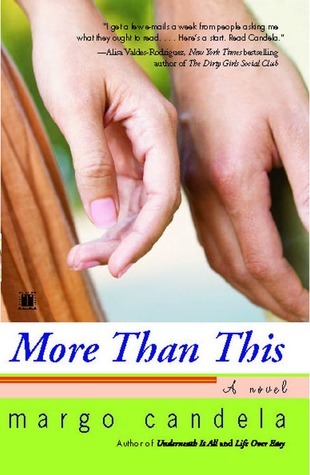 Let us know what’s wrong with this preview of More Than This by Margo Candela. To ask other readers questions about More Than This, please sign up. While clean sexually, still a lot of bad language. I just picked up this paperbook last second before I checked out some books for Isabel and was hoping to be pleasantly surprised. Wasn't. Anyway, the whole thing is kind of "Serendipity"-esque (the movie) with the main characters always coming close to meeting, and never doing it until the last page...literally the last paragraph is them walking towards each other. It really bugged me because I enjoyed both of While clean sexually, still a lot of bad language. I just picked up this paperbook last second before I checked out some books for Isabel and was hoping to be pleasantly surprised. Wasn't. Margo Candela has written a wonderful novel based on a parallel universe that truly shows her strength as a writer and her creative imagination. Not an easy plot scheme to achieve, writing in parallel universes requires careful planning and plotting so the reader is right there with you, seeing the connections that are created, but no spelled out. Living in both universes, yet keeping them both separate. Margo manages to interweave these two parallel universes without missing a beat. Keeping the reader intensely engaged on these two characters and when they will meet, when they will make the connection, and how it will all happen. Well, masterful is the only way to describe how the story unfolds and how the two eventually meet and make the various connections that have been unfolding in their lives -- that only the reader is privy to. As a reader, you are constantly rooting for this couple, for Margo lets us into their lives and develops their characters to be true friends that you want to see succeed. This is a fun read for anyone who is looking for a great book that does not stereotype Latinos, but shows well adjusted, successful, and mainstream Latinos, who fall in love, care about each other, have family issues, and in the end, are fabulously lovable. Margo Candela is a Latina author who writes with a strong Latina voice, mixing bits and pieces of the culture into her universal stories and plot themes. No stereotypes in her novels, just strong Latinos/as who give us glimpse into the culture that gives us wings to fly and roots to stay grounded. Margo passionately weaves the best of la comunidad Latina with wit, wisdom, talent, and humor. 1. Describe a time when you faced moral and ethical issues like Alexander? 2. Evelyn goes through great lengths to be thin, what are you willing to do to get that perfect body? 3. Evelyn and her sister Tanin are different and alike. How are you like your hermana, prima, o comadre favorita…how are you totally different? 4. Who is your favorite author Jane Austen or the Bronte Sisters? Which novel, written by one of these authors, is your favorite? 5. What is your favorite Mexican restaurant? Mexican meal? 6. Can two people who have never met, fall in love? I adjust the mirror to the side of the easel so I can see my naked back reflected in the one behind me. Oc Margo Candela's Good-bye To All That is our featured book in March, but I wanted to check out some of her other work as well. It dawned on me after reading More Than This that this was the first time I've read a chick lit book that featured a Latino love interest. A lot of times, if it's a book about a woman of color, her love interest is a Caucasian male or male of her own ethnicity. This time around we're lucky enough to meet the handsome and well-spoken Alexander Velazquez, attorney-at-law. Review: This whole book is written in the POV of Evelyn and Alexander--the two main characters or "lovers" in the plot. It is in the classic "He said, She said" format. Alex and Evelyn get their first "hit and miss" at the airport as they head back to San Francisco. The whole book consists of nothing but the "hit and miss" of these two characters. And as they go about wondering about the person across the building, they each go about the personal and professional turmoil in their lives. Some scenes, I admit, I skipped because they were just too boring to read, like Evelyn's shopping excursion with her sister and friend. Who cares about the prada whatchamacallits? Other times, I felt that the story had a few too many characters, although Sigrid was fascinating--she was one those types that I can't stand: a scary girlfriend and an even scarier ex-girlfriend. Whooo, if I were Alex, I would've left her too. I liked that this book had the classic Margo Candela humor that we've come to love in her other books, and I was impressed how well she was able to write the male POV; but, still, it did nothing to compensate for the constant frustration of having to go back and forth between each character. I practically had to re-read some parts to figure out where I left off with each one. Learned about this new book via a review and since it was a romance, threw it in for vacation reading. It’s an interesting premise. Rich socialite Evelyn Sinclair, and laywer Alexander Velazquez live and work in San Francisco and have several close encounters but don’t actually meet. Instead they can see each other through their office windows, and occasionally on the street or the bus. The novel alternates their voices, and the ending really brings it all together. Totally enjoyed this book. Began it Sunday afternoon, done it by Monday evening. I had to work Monday, after all! Two people are re-thinking their lives. A series of almost meetings. Parallel lives. They end up working in buildings located across the street from each other and notice each other. I loved the end when they finally meet. I recently bought and finished this book. It deals with what is probably the most painful question for most of us: What if? What if I have said this? What if I have done that? It is hard to put that book down, because it is so easy to relate to each and every character presented in the book. Highly recommend it. This book was a really great snapshot of two lives- that almost intersect. It's a little bit romance novel, but mostly a character study of one rich girl trying to be like your everyday working person and one man trying to move from his roots to the heights of society. And their plans all change depending on family. I really enjoyed it. This was the second book by Margo Candela I've read and she is becoming my new favorite author. I saw myself in Evelyn and my sister is so Tannin, minus the rich, socialite part. And I'm glad it ended the way it did. Any more and it might have ruined it for me. I highly recommend! I picked this one up a few years back, at just the right time. It was a random featured book at a bookstore and I was feeling low and needed some alone reading time. That being said, it was a great dose of chick lit and I've returned to it a few times in the past few years. An interesting idea, and good build up. This is a story about the promise of a relationship, not the relationship itself. A little bit disappointing that it doesn't go further in the end, but I can see how really it's better that way. COULD have been a great book. For me the language was completely foul and the open ending ruined it. I did like the main characters, and the author was on the right track. Great idea...poor execution. Cute, easy read told in a unique way. Great for vacation or when you need something light between other books. This was a fun read! I liked the main characters and the way the story keeps leading up to what happens in the end. I did wish the book kept going instead of how it was left. If you have ever wondered about a relationship with a stranger who caught your eye this is the book for you. I enjoyed each character who brought their own feel to the story. Interesting story and a quick read. I was drawn in and wanted to find out what happened, but thought the characters weren't fleshed out all that well. i had such high hopes for this story, and kept reading in hopes that it'd finally get good ... and when i finished, i thought "really? there had to be more than just this to the story!" An optimistic read. A little anticlimatic and predictable, still fun and a nice way to pass the time. I did not like the ending of the book - I would have liked the author to have at least had a chapter on the beginning of their life together. Such an interesting premise...great romance. I did like the writing style but I think this would have made a great play. I never quite connected with the characters. I was kind of disappointed by that. But it was great for a quick read. A good reminder why I generally don't read chicklit. Stereotypes all over the place, from the ruthless Latino lawyer with the heart of gold to the frivolous society girl. All I can say without giving it away is, bad ending-what the book was truly about didn't come until the last page. Too much reading for just that. I was disappointed. The cover and the synopsis is really interesting. I was expecting something "more than this". Margo Candela is the author of five novels, The Brenda Diaries (SugarMissile, Oct. '11), Good-bye To All That (Touchstone, July '10), More Than This (Touchstone, Aug '08), Life Over Easy (Kensington, Oct '07), Underneath It All (Kensington, Jan '07). Margo is currently working on her next novel as well as working on a three book Young Adult series.